I’ve been feeling my age lately. Maybe I should say, noticing my age. And not in a bad way. Not in a “woe is me, I’m getting old” way. Rather, in an objective observer, almost out-of-body-experience way. A kind of… huh… I’m sixty-two… waddya know… way. If that makes any sense. 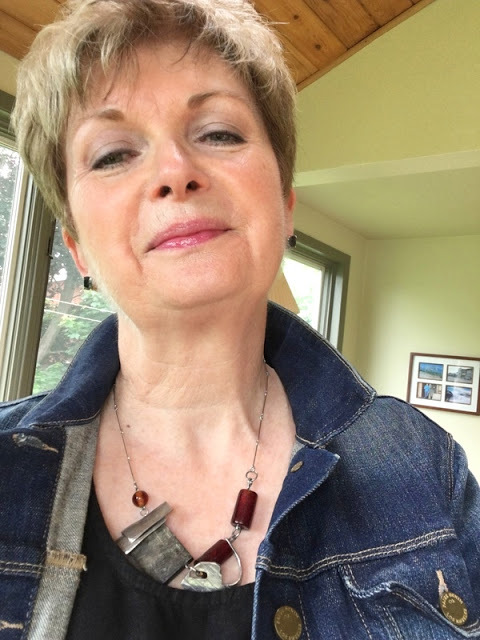 Noticing my age: the lines on my neck, around my eyes, and on my upper lip. And instead of being bothered, I’m kind of happy. Happy to be joining a fraternity of women I admire, and revere. All those older women I know, and some I have never met, who embrace getting older. So to celebrate my new found equanimity, I went out and bought a new dress. Actually I bought the dress the day before my birthday, at a small store called Escape on Bank Street here in Ottawa. I went there in my quest for a flowy, cream-coloured cami to wear under my crocheted sweater, and I came home with a dress. I loved this dress the minute I pulled it on. You see, Leslie, co-owner of Escape, and I were chatting while she pulled tank after tank, and what seemed like a million camis and underpinnings, all of which I tried on with my sweater, to no avail. And then she pointed to a rack of linen dresses from a brand called “Click by Colour Me Cotton” made in California. And I tried on this one and loved it. My new dress has a full skirt but it’s not girly. The dress has a full skirt, but it’s not a girly full skirt. The way the fabric is pieced together, and the myriad pin-tucks all over the skirt, and along the hem, make it fall in soft folds, slightly longer at the sides than in the middle. And it’s a perfect length for me. A longer midi skirt, that hits me at mid-calf, would make my legs look like sticks. That’s the same reason wide-leg cropped pants are not flattering on me. Well, one of the reasons. Ha. The perfect length dress with flats and a jean jacket. The dress is light and airy. I love it with my old Michael Kors sandals and my Paige jean jacket. I think it needs something at the neck, so I wore my Anne-Marie Chagnon necklace, and for a bit more colour, I added the red leather cuff by Caroline Faiers that I bought in Covent Garden last fall. I felt pulled together, exceedingly comfortable, and pretty darned fabulous in this outfit. A kind of “this is me at sixty-two” outfit. I’m a little bit older, a little bit more wrinkly, a little bit heavier… but what the hell… who cares, eh? My “this is me at 62” outfit. 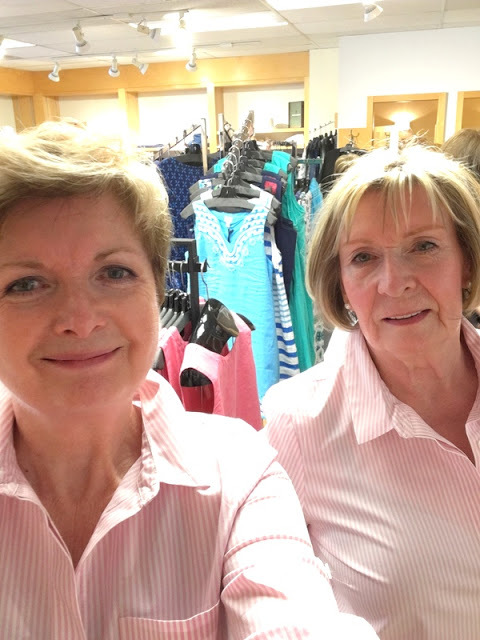 And since I had had such a great experience at Escape, when my sister Carolyn and I had a day out shopping together recently, that’s where we headed first. Carolyn was looking for a few business casual pieces, jeans, and some tops to wear under her lab coat at work. I was just looking. We laughed when we came out of the dressing room wearing the same shirt. Ha. It was ever thus. What one has the other wants. That’s sisters for you. Now we each have a pink striped summer shirt. I have a long, long history of shopping with my big sister. 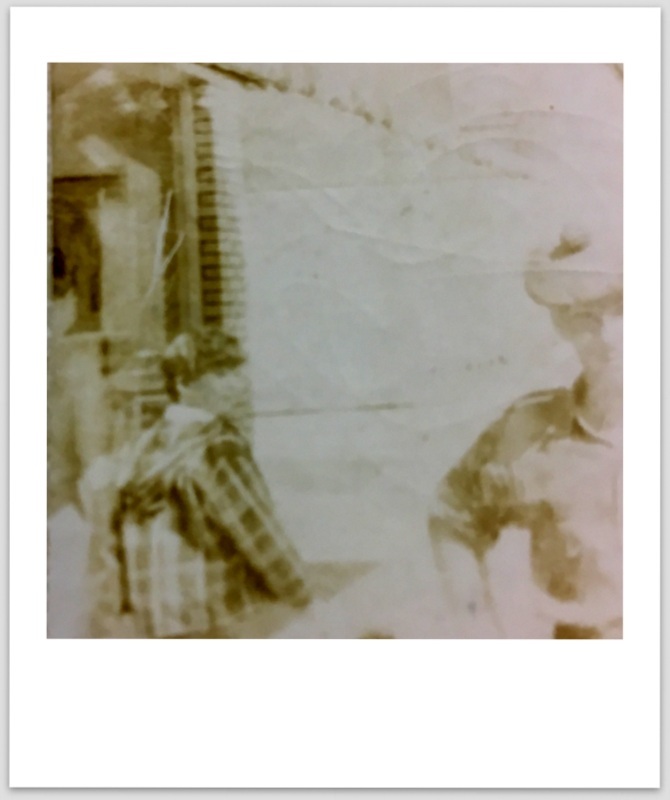 See this old faded photo below? It was taken in downtown Fredericton. In 1966, I think. That’s me, age ten, in the plaid jacket. I remember I was wearing my Maple Leaf tartan windbreaker, shorts, sneakers and a white blouse that day. You can see Carolyn on my left if you look carefully. She has her long hair pulled up into a bun on top of her head, an orange tee shirt, and white slacks on. I’m turning around to look at the soldier in uniform who’s getting his picture taken with one of those new-fangled, self-developing Polaroid cameras. When they pulled the picture out of the camera and noticed that we were in it, the soldier and his buddy chased us down the street to give us the photograph. It was pretty nice of them to do that, even though I think that they were more interested in the chance to talk to Carolyn than anything else. Carolyn and me… and some random soldier. Circa 1966. I think. So on our most recent shopping trip we made our purchases and then decamped to a nearby restaurant for lunch. Over our salads, we talked about clothes, and family, and travel, and our respective plans for the next few months. What a great day we had. When I started writing this post, I thought about how many of these shopping days we’ve had over our lives. From when I was a kid, proud to be tagging along with my beautiful big sister, to now-a-days when we laugh that I am her number one shopping consultant. And so I spent some time this afternoon, digging out that old photo, which I can see in my mind a lot more clearly than in reality, now that it’s so faded. And I thought how funny it is that this week, I’m feeling pretty chill about being sixty-two, when a couple of weeks ago, a chance encounter with an unflattering reflection had me plunging into the depths of despair, at least for a couple of days. But this week, I’m good. Quite content to be sixty-two, a bit more wrinkly, and a bit heavier than ten years ago. Feeling my age, but not in the pejorative sense. Not giving up and giving in, just acknowledging. Acknowledging my age, and my history, and happy to be just where I am right now. For now, anyway. How about you folks? Are you feeling your age? PrevPrevious storyDressing Like a Grown-Up. Ah, I love this post and your affirmation of yourself. I'm going through a metamorphosis, coming out of the fog of widowhood. Somewhere during the 5 year period I turned 60+, I am acknowledging my beauty and brains again. Thanks for sharing, Happy Birthday! Oh dear…I imagine the past few years have been very difficult. Welcome back. Regarding women coping with aging , I would really recommend a BBC documentary called ‘ Nothing Like A Dame ‘ . It is a get together of Judi Dench , Eileen Atkins , Joan Plowright & Maggie Smith at Joan Plowright’s country home . They meet regularly & are old friends . Whilst they are showing some vulnerabilities now , in their eighties , they are are all bright , clever & witty . I laughed so much when I watched it last night . A great example to us all . I hope you are able to catch it in Canada . I don't like fussy jewellry either. Just the quirky, chunky, or odd stuff. Especially in necklaces. My sister and I have exactly the same taste, that's why I can pre-shop for her so easily, or stand outside the dressing room giving the nod (or not) to whatever the salesperson brings. Such power! I just looked at the trailer for that documentary. Hope we get to see it here. I love all those ladies. That's The Dress for you, it's got your style and personality all over it. I agree with your observation with being all over the place with how you feel about your age. I'm like that too. I blame it on my hormones. I have observed of late that I have times of despair, sadness, negativity. Rather like your funk! I've been lucky enough to spot the trend, these bouts come around the same time of the month. Not every month, but when they do then that's where they land. I suffered from pre menstrual depression, not always, just some months. So my view is that at my age I still have some degree of hormonal swing, so now I just live with it, recognising it for what it is. And I feel better for knowing what it is and that it will pass. Understanding is key. So I mostly feel OK about being 68, but sometimes I don't! That's my experience anyway, we're all different. Thanks, Mary. I must track my "funky" days and see if they follow a pattern. But yes…those down days, tearful, tired, cranky days sure seem to feel like PMS. P.S. You definitely don't look 68 my friend! You are in good company I think with the way you feel about your age changing week to week. 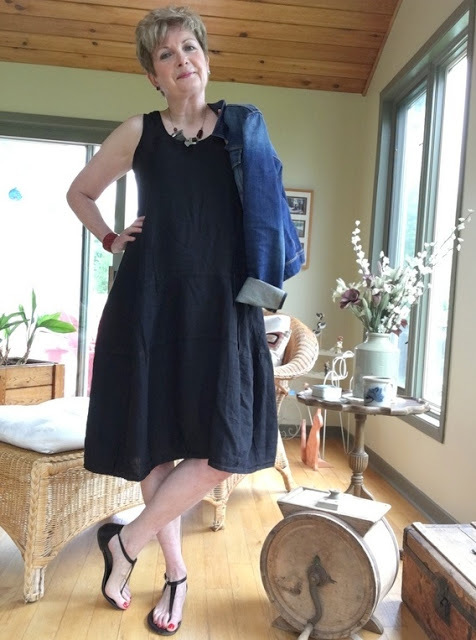 I am struck by the dress and thinking I have one that is very similar, a navy linen longer dress from Eileen Fisher from a few years ago. I wear it with a lightweight crochet type matching short sleeve cardigan and some type of major silver or blue necklace to give it a pop, I am about to stop working and had assumed I would consign this dress, but you have me rethinking that. It will actually make a nice hot ad humid weather dress. It looks great on you, and very classic with the denim jacket. I also think you could dress it down with your red loafers or even add a scarf in cooler weather. I really enjoy your posts, thank you for putting your thoughts out for us to ponder! I don't think that I would have gone looking specifically for a dress this style. It's not cutting edge fashion by any means. But it's so comfortable, and I think that changing up footwear, and jackets/sweaters can make it current. I've thought of wearing it with my Stan Smith sneakers or my red loafers… we'll see. Love your new dress and relate so much to this post! It's wonderful to find a dress that fits and makes you feel great. I have decided that when the temps hit 28C here in Montréal I'm wearing sleeveless no matter that I don't have Michelle Obama arms. 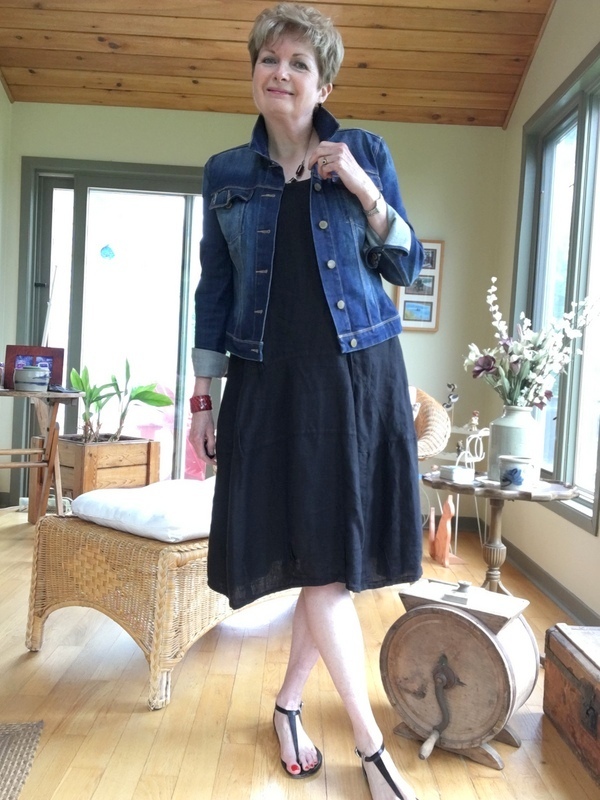 I turn 70 next month and try to look current, but can't get on board with some youthful trends, such as cold shoulder tops or the use of "me" in the nominative case, as in "Me and Susan went shopping". I know exactly how you feel. I've been wearing more long tanks on the really hot days these past few years… but with jeans which are not cool on a humid day. A dress will be much more comfortable. I'm with you on the cold shoulder everything. Uggg. Wow… you and your sister must really be of like minds. Thanks for the kind words…as always, Alayne. Love,love,love your dress! It is a kind of dress I wanted to buy last year,but than the life happened and I had to buy more formal black silk shirt dress. It is beautiful indeed,DvF,I've wear it a lot,but it is not my dream linen dress. You'll have a lot of fun wearing it. I don't mind wrinkles (this covers both of your questions :-),I guess). Is it navy or black? Thanks, Dottoressa. You are truly a dress person, aren't you? Maybe wearing linen more will make me less conscious of wrinkles in every sense. Ha. Such a great look. Very chic with those flatties and the red nail polish. You inspire me with your words about being comfortable with your age. I was feeling my age yesterday at a wedding, surrounded by gorgeous young women. Just hope they appreciate what they have, because at that age I never did. You know, I don't know many gorgeous young women, whose style I admire. A few teenagers, like my great-niece. I don't mean that I want to wear what my great-niece Carly wears, at 17 she can bare a mid-riff and still look smashing. She has a flare for choosing what looks good on her. But I often find that so many 30-something or forty-something women don't know how best to dress their bodies. I've often wondered why that seems to be the case. I’m sure they don’t. That’s the second beauty of youth-the bliss of not being concerned with aging. I imagine they are stressing about something… just like us. I know I was at their age. Aaaahhh … learning how to adult. It is never, ever over. At least it's not yet over for me after 72 years of trying to figure it out. As an elder now, my grown-up goals keep changing. Likewise, my body, relationships, resources, and the culture(s) I live in are changing so rapidly. Of course, all that was changing before now, but then I was young and restless, and time moved much slower, allowing me more time to adjust. Now that I'm old — it's OK to say that word, even if it's hard to believe it's true — it's a bit like I'm a a teenager again — confused, challenged, overwhelmed, and again wrestling with the same existential questions I was too busy these last 50 years to be bothered by. I'm one of the silly optimists. I now understand that I'm terminal. We all are. Certainly, my jaw line is terminal, but if it bothers me much more I'm going to do something about that! But until then, I agree that we should wear more linen. 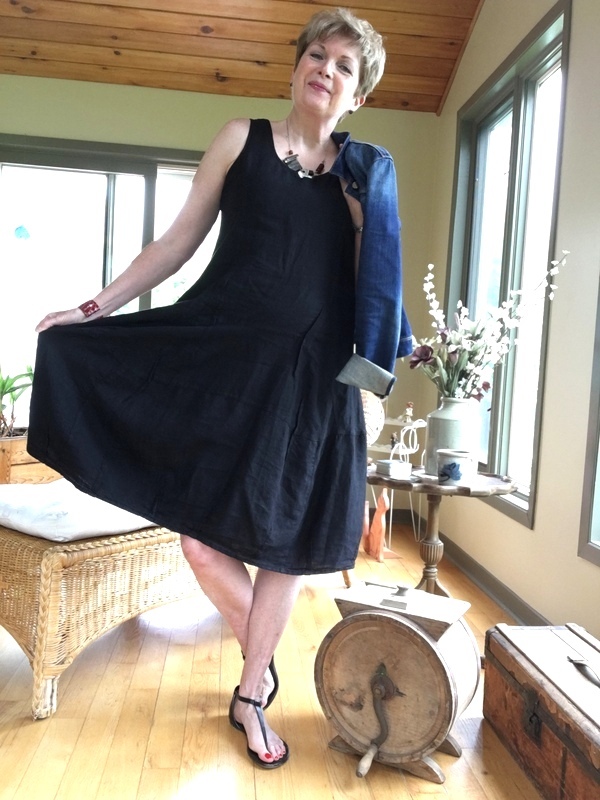 Speaking of which, a navy linen sleeveless "gunny sack" is exactly what I plan to wear as armor to this coming week's "big women's event," accessorized with some of my husband's best gifts of jewelry and an Hermes shawl he shocked me with one Christmas. For a guy who lived in double denim, he always knew how to pick out the good stuff. And really — I do think it's all going to be OK. I love this exchange (made me a bit weepy, truth be told). Hugs to both of you — Ann, that Hermes shawl must feel like a big embrace, I hope. . . I had a hard time finding current websites for the company that makes my dress, which is why I didn't include a link. Hope the visit to the bricks and mortar store works out better. Also hope the fishing trip comes off. I remember waiting for Hubby's all clear before we could head for France in 2015. Best of luck, CHarlene. Thanks, Polly Sue. I grew up down east where moving "out west" was a right of passage in the seventies. I wonder what my mum was thinking as all five of us headed across Canada one by one for employment opportunities. She never said, but it must have been hard. I really like this look on you! Relaxed, fresh and breezy. Thanks, Sue. Just when I thought I was done with black. Ha. I have no sisters but am fortunate to have a daughter who is a joy to shop with. In fact, spent some happy time browsing shops with her this weekend. Oddly I enjoy shopping for clothes much more as I get older because I know what I want and am prepared to look for it. And a denim jacket is on the list, as it happens. Having tried on my daughter's this morning, I am now on the trail. As regards the passing of time…I found my 50s difficult, tiring and confusing. My 60s I am so far enjoying much more, rather as I did my 40s after the perplexities of my 30s. I read on your blog about your weekend in Belgium. And shopping with your daughter. Sounded lovely… a little time to explore on your own, some company for shopping and dining… and sipping wine, and a couple of excursions. A perfect weekend. You look fantastic. I love your dress and denim jacket. I've got a dress very similar to that. Ikind of feel youthful in a good way in it. I think because of the length. You've given me the idea to wear it with denim now. Thank you. 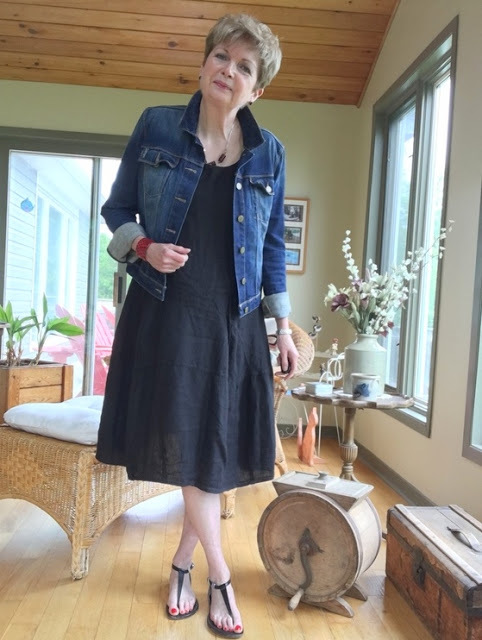 Your Paige jean jacket really enhancing the beauty of this wrap style dress. These open sandals are looking good as well. I also love to wear sleeve dresses in summer to protect my skin from sunrays. You Paige jacket is doing this for you.